Average global wheat yield increased every decade and during the past five years. For example, average yield increased by 20% in the 1990s, 9% in the 2000s, and 10% during 2010-2014. Average yield was 149% higher in 2010-2014 than in 1960-1969. Global warming, where is thy sting? Average global output increased every decade and during the past five years. Average output was 157% higher in 2010-2014 than in 1960-1969, increasing 12% in just the past five years. Output increased 16% in the 1990s, allegedly the warmest decade of the millennium (IPCC Third Assessment Report, p. 3). That is all the more remarkable considering that Russian grain production fell by nearly 40% in the 1990s after the collapse of the Soviet Union. So whether or not Asseng et al. correctly estimate that a 2ºC warming would have reduced absolute yields during 1981-2010, improvements in management and technology have so far outpaced climate change. My guess — and it’s only a guess — is that the ingenuity of farmers will continue to trump global warming over the next three decades. If growing conditions for wheat become too hot they will be replaced by maize and if too cold by oats, or at least until we get well into the current Little Ice Age that started in 2002! I am not convinced that we are entering an LIA. I have seen no evidence of that. Thanks for the illumination, Peter. I just checked, and, as you suspect, Asseng et al. make no reference to growing degree days or crop heat units. Although maybe those concepts are implicit in their analysis? I don’t know. I’m less than a novice in this field! What struck me is the researchers’ claim to discern the grim reaper of climate change in six decades of increasing production and yields, and their confidence that, despite past success, things can only go from bad to worse. They are wrongly equating yield increases in cereals with temperature. The most important factors have been the use of tram-lining ( those tractor marks you see in wheat fields ) combined with the use of GPS equipment on the planters, fertilizer applicators and sprayers that have allowed precision seeding and precision feeding and this has been combined with the use of pumps to control the level of the water table. In addition we have slow release fertilizers that match crop demand and of course the use of GMS seeds that allow the elimination of competing weeds. People outside of the agriculture industry often have a vision of yokels with straw in their hair but in fact it is one of the industries with the highest level of technical development from early use of large computers in devising feeding programs for farm animals, advances in genetics ( cloning came from agriculture via Dolly the Sheep), advanced chemistry in the design of agro chemicals, vaccines and so on. I started my career in agricultural science in Africa in the 1960’s when the current scare was the Malthusian claim that we could not produce enough food for the increasing population. We and others agricultural scientists in many countries were so successful(we increased the yield of maize grains from 200 to 6000 kg/ha) that nowadays the problem for farmers is the surpluses that depress price. Another byproduct of our success was that Governments decimated the research programs, a fate that hopefully awaits climate science but for a different reason. Something to bear in mind when you read papers like this is that cereals and crop yields in general are only half or less of the potential with the major limitation the lack of atmospheric carbon dioxide where the optimum level for crop growth is 1200 ppm +. Increasing atmospheric CO2 to double the current value is known to increase yields of cereals by about 45% and nearer 90% for tree crops and as a beneficial side effect if these CAGW temperatures ever come about the demand for water is considerably reduced as the crops switch to fewer but larger stomata to cope with the increased level of CO2. What nonsense. How many places would love to be 3 degC warmer? If I look at places 3 deg warmer than where I live, I see huge crops of wheat, sugar cane, tropical fruits – mango, bananas – the possibilities seem endless. It seems to me that the IPCC temperature models have failed to match real data. The predictions by many scientists that doubling CO2 would result in about 1 degC temperature rise is looking more accurate. Globally, wheat production has increased 33% over the past 20 years, with 2014 setting a new record. I really don’t think wheat production has much to worry about from global warming. It’s amazing how any good news is converted to bad news by climate alarmists. Why can’t they get excited and consider that, when looking at real data, it seems that global warming may not be bringing the doom and gloom previously predicted. A few more comments to add to those I made earlier. First a UK comparison of models of cereal production against real data show that they are no more accurate than climate models! 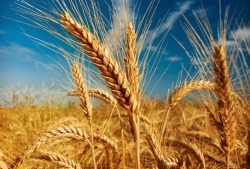 Wheat models such as CERES-wheat, AFRCWHEAT2 and SIRIUS predict grain yield and have been widely used, in particular to assess possible effects of climate change. Here, observed yields from well-managed and documented UK agricultural experiments were used for a large-scale study of these models’ grain yield predictions. None of the models accurately predicted historical grain yields between 1976 and 1993. Substantial disagreement was found between the models’ predictions of both yield and yield loss due to water limitation. A regression of observed yields on monthly climatic variables indicated that indirect climatic effects play a considerable role in UK well-managed yields. The study shows that more work is needed before such yield predictions can be used with confidence in decision support or climate change assessment in the UK. Next the average yields per hectare are only around 40% of those that are being achieved by intensive methods such as that proposed by Laloux in 1982 – tramlining. And the yields given in these articles of c.a. 8 te/ha for winter wheat are only 60% of the yields achieved by the best farmers and only 45% of the record UK crop. Then on temperature, it is cold that is the problem as winter wheat is planted in September/October and if the ground freezes for too long there is a high rate of kill of the seeds which means the crop has to be patched in the Spring or lost altogether. It is Winter and Spring temperatures that count and most of the global warming data I have looked at for the cereal growing areas showed the temperature rise to be at these times and not during the Summer maturation period though now the winter temperatures in Europe have been falling since 2002 and this will affect wheat yields.